Capable of driving up to 4 individual coils. ECU program stored in reprogrammable FLASH memory. ECU map data stored in permanent EEPROM memory but changes can be made to all maps via pc. Fully adjustable revlimiter with soft and hard cut capabilities. Digital tacho and shift light LED outputs. Adjustable coil charge pulse length for use with different specification coils. 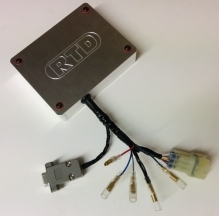 Can be used with a Throttle position sensor for load vs engine speed mapping or 2 and 4 position map switches for selecting different advance curves. CAN 2.0B (active) interface for transmission of data between ECU and third party dashboard devices is also available. Windows based Infinity mapping software.